About Us – Jack's Butane Service, Inc. In the late 1940s, Jack Rudolf returned from the service in WWII to the central valley of California, where he was born and raised. He married Norma Bishel and got a job delivering butane for Braggs Butane in the Fresno area. 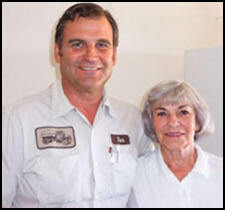 Before long, Jack and Norma decided to purchase a delivery truck of their own, starting Jack’s Butane in 1950, and they worked out of their home in Biola. Back then, Jack sold butane (hence the name Jack’s Butane. He delivered butane to the farmers in the area for a whopping 12 cents per gallon in the fifties! A lot has changed since then. The gas we sell now is propane. We have our own storage facilities in the Biola and Coarsegold areas. Oh yeah, and we don’t just service Biola anymore. We deliver to Fresno, Madera, Keman, Clovis, Bass Lake, Oak Hurst, YLP, Coarsegold, North Fork, Raymond, Easton and parts of Sanger. As much as things have changed over the past 60-plus years, some things have stayed the same. Jack and Norma’s son, Ron (Jack Ronald Rudolf) now runs the company. Ron was trained by his dad in every facet of the company, starting when he was old enough to hold a wrench. Ron has added his wife, Yvonne, and son-in-law, Clayton Manha to the family business. They also added many wonderful employees to the company who believe in treating customers like friends (many of whom are). Jack taught Ron to believe in honesty and integrity, we do what we say, and love what we do! Whether you need to replace or repair your heating/air conditioning unit or hot water heater, or repair or convert your gas stove, we offer the highest quality products, installed by courteous, professional servicemen. We stand by our work and when it comes to safety, we’re number one, because we’re the local guys, we live in this community too! We’ve worked hard, more than 60 years, to build our reputation and uphold the standards that Jack Rudolf set. Ask your neighbors about us! 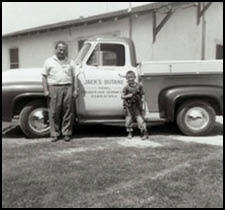 Founder, Jack Rudolf and his son Ron, 1955. (Jack)Ronald Rudolf and his mom, Norma Rudolf Gardner.